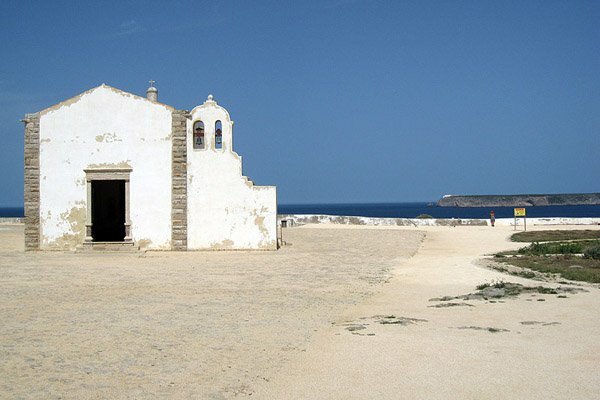 A small church within the Fortaleza de Sagres. All photos by Brad Stell. Two NYC creatives went to Sagres, Portugal, the southwestern-most tip of Europe, and got in touch with their inner explorer — like so many navigators who had been there before them. 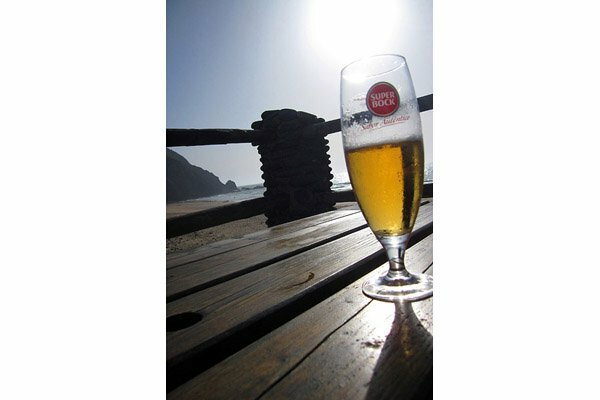 SAGRES, Portugal – We didn't have a plan. It seemed fitting that while in the birthplace of Portugal's Age of Discovery we'd let our sense of wonder guide us. Fortunately, one of us has a good sense of direction. 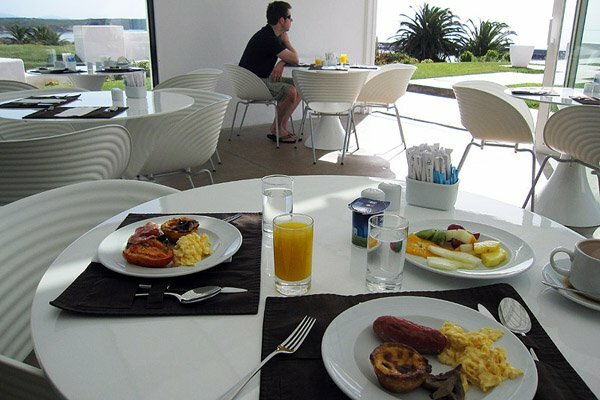 Breakfast at Memmo Baleeira Hotel. The morning started with breakfast at the . Offerings included the usual suspects: yogurt, fruit, a variety of meats, eggs, tomatoes, and pastel de nata, a tasty traditional Portuguese egg tart. The back lawn at Memmo Baleeira Hotel. 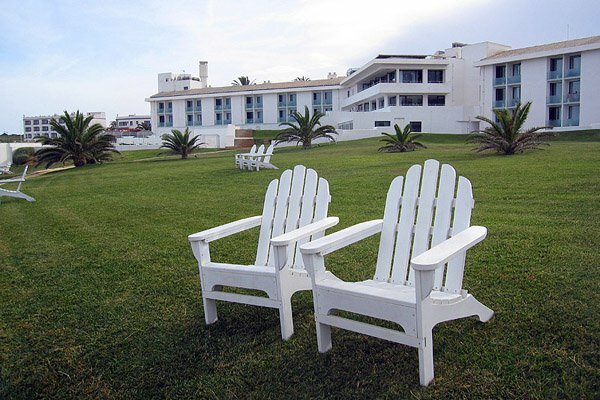 After filling up we wandered out back to the white Adirondack chairs on the hotel's expansive lawn. It was a clear, sunny day and both the sky and water were gorgeous shades of blue. It was the start of taking in many views from the cliff-laden shore town, Sagres. Barnacle-encrusted pots connected by rope that are used as octopus traps. We borrowed bikes from the hotel, packed sunscreen and beach towels, and headed out to the fishing port down the road. Amongst a variety of rusty boats there were working fishing vessels, mostly private, but a few you could hire to take out sightseeing or fishing. 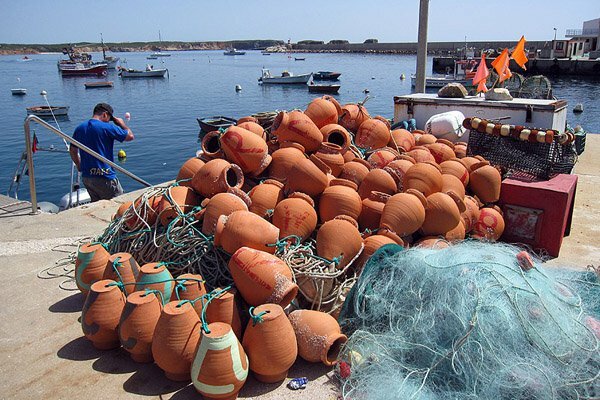 The docks were covered with piles of fishing line and terracotta pottery. We were surprised to learn that the barnacle-encrusted pots connected by rope are used as octopus traps. 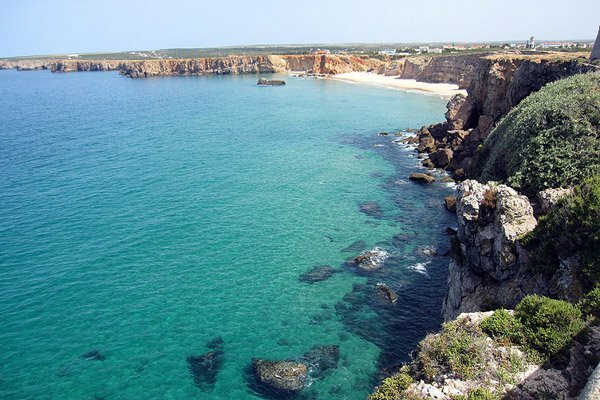 The view from Fortaleza de Sagres. We left the port travelling west with no destination in mind. We found ourselves veering off the road onto a rocky dirt trail leading out to gigantic cliffs overlooking the Atlantic. 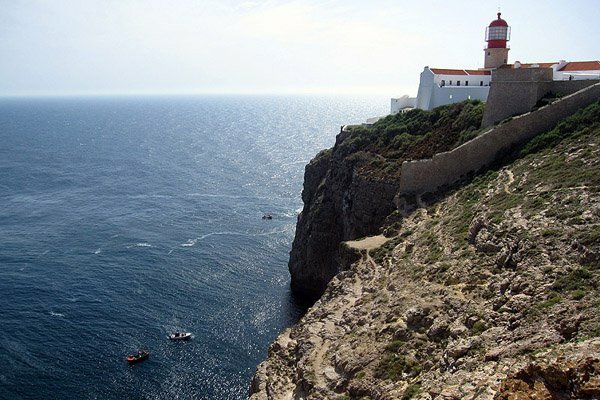 We'd started to get our bearings and could see our next destination in the distance — the Fortaleza de Sagres. 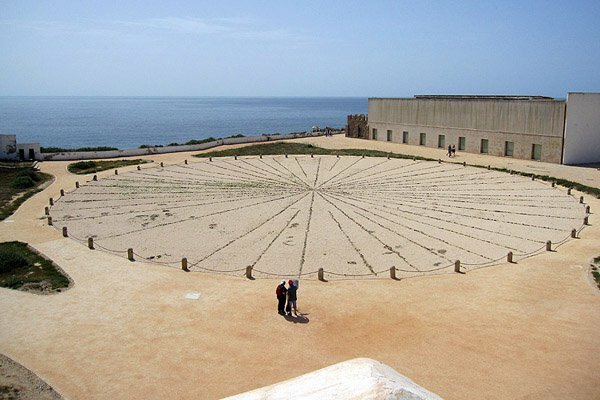 Rosa dos ventos, a 43-meter compass constructed out of pebbles. It's believed that Fortaleza de Sagres is where Prince Henry the Navigator set up his school of navigation in the 15th century. Beyond the impressive sight of local fisherman balancing dangerously off the rocky cliffs, there's a modest church from 1579 and a dramatic rosa dos vento (compass) constructed out of pebbles that measures 43 meters across. It was easy to understand why early explorers were enticed to see if anything existed beyond the seemingly endless Atlantic. 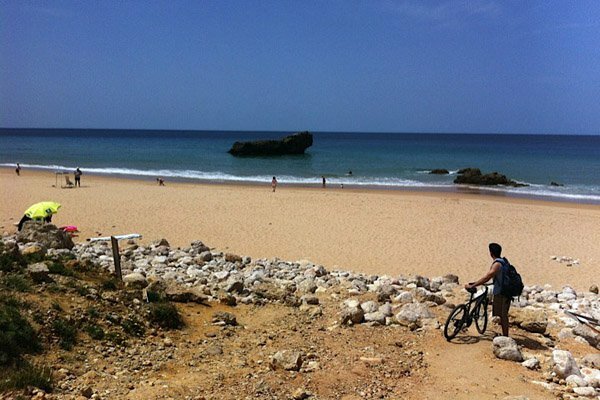 We rode down to Praia do Tonel, a beach located on the northern side of the Fortaleza, to soak up some sun and take a refreshing swim. The brawurst cart, of all things to see on the side of the road in Portugal. 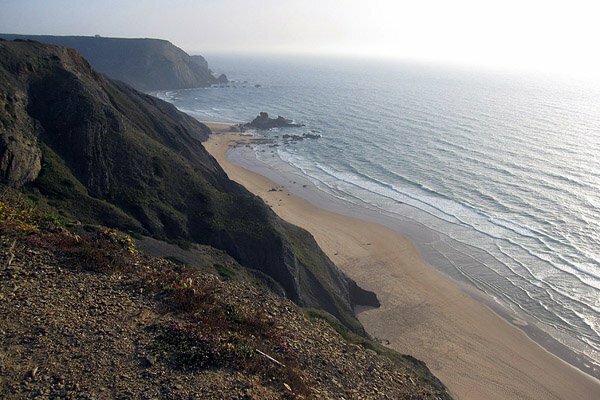 After the beach we continued to Cape St. Vincent on the southwestern most tip of both Portugal and Continental Europe. 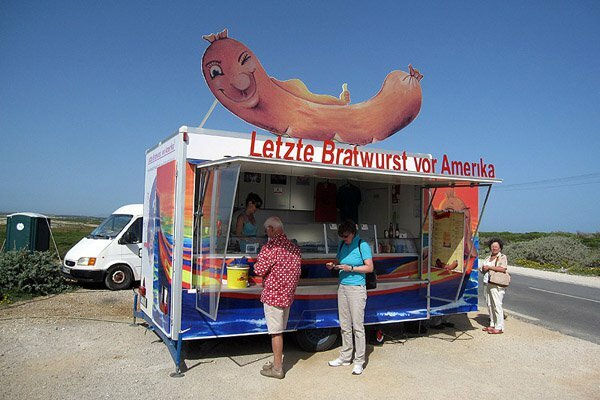 Along the road were vendors selling whimsical local wares, ice cream, and tasty — albeit odd — . Upon arrival we opted to explore the lighthouse from outside rather than pay the fee to enter. We weren't disappointed: The dramatic scenery of the cliffs and fishing boats below made for a spectacular view. 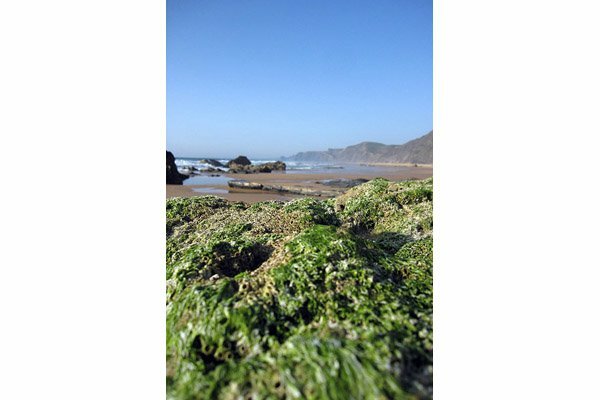 The cliffs surrounding Praia do Cordoama. After returning the bikes at the hotel we freshened up and took off in search of the sunset. We drove through grassy hills, passing the peaceful town of Vila do Bispo, until we arrived at the surf beach Praia do Cordoama. We walked along the lengthy shoreline, stopping for interesting sea shells and to throw stones until we crossed over to another beach, Praia do Castelejo. Drinks at Praia do Castelejo. We ordered drinks at the surfside restaurant, a perfect spot to watch the surfers tackle the waves. The view from above the beach. Although the view was near ideal from the beach, it was even more impressive from atop the massive ragged cliffs. 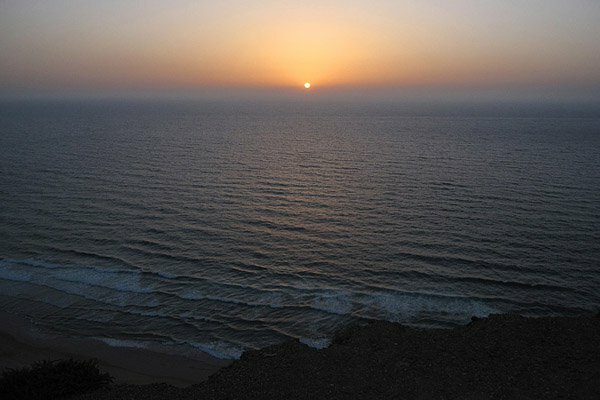 We'd made it just in time to watch the sun drop into the ocean at a place that seemed like the end of the world. Starving and back in the town of Sagres we grabbed dinner at Restaurante Carlos. A simple family run restaurant, serving generous portions of traditional Portuguese food, located on the main street in town. We enjoyed friendly service and feasted on local specialties like sardines, octopus salad, clams, and stewed pork. Full and satisfied with our adventures we bellied-up to the hotel bar for a glass of local wine before calling it a night. Brad and January moved to New York from the mountains of Colorado. Brad works for a digital agency in Brooklyn. He travels to justify the purchase of an expensive digital SLR camera. January is a creative director at a New York City advertising agency. She travels to expand her worldview, get out of her comfort zone, and to learn all the different ways a toilet can flush.